William Robert Dickinson (1815-1887), Lowes Cato Dickinson (1819-1908) and Gilbert Bell Dickinson (1825-1908) were the three eldest surviving sons of Joseph Dickinson (1780-1849), a stationer and print-seller who had a fine art business at 114 New Bond Street, London. [ABOVE] A photograph dating from around 1865 showing the buildings numbered 106 to 108 in Brighton's King's Road. 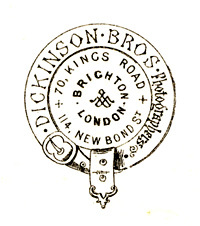 The firm of Dickinson Brothers, Artists & Photographers and Print Publishers, were located at 107 King's Road, Brighton between 1865 and 1867. At No. 108 King's Road, to the left of the Dickinson Brothers' business premises, was the photographic studio of Hennah & Kent and the print-selling business of W. H. Mason. The main focus of this photograph is Fred Wright's Pianoforte Music Warehouse at 106 King's Road located on the corner, at the junction with Cannon Place. By 1866, the Pianoforte & Music Warehouse at No. 106 King's Road had been acquired by Robert Potts & Co. a firm of music publishers. The first photographic studio in Brighton which was owned by Dickinson Brothers was at 70 King's Road, Brighton. 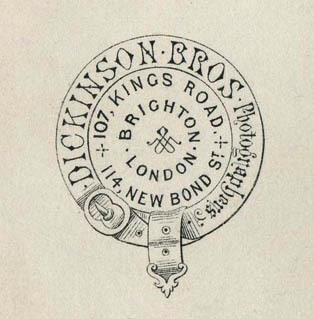 The photographic business of Dickinson Brothers was based at 70 King's Road, Brighton from 1862 until 1865. Around 1865 the Dickinson Brothers studio re-located to 107 King's Road, Brighton. [ABOVE] The trade plate of Dickinson Brothers, Photographers, of 107 King's Road, Brighton and 114 New Bond Street, London. [ABOVE] A portrait of Lowes Cato Dickinson (1819-1908), the artist and portrait painter who, with his brothers William and Gilbert, operated the firm of Dickinson Brothers in Brighton and London. 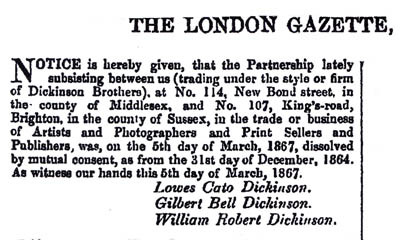 [ABOVE] A notice published in The London Gazette announcing the dissolution of the partnership between Lowes Cato Dickinson, Gilbert Bell Dickinson and William Robert Dickinson, who were trading as "Artists and Photographers and Print Sellers and Publishers" at 107 King's Road, Brighton, and 114 New Bond Street, London, under the name of Dickinson Brothers (The London Gazette, 3rd January 1868). [ABOVE] Carte-de-visite portrait of a man seated beside an occasional table and reading a newspaper, photographed at one of the Dickinson Brothers' studios, either in Brighton or London (c1863). The credit on the reverse of this carte-de-visite reads: Dickinson Bros., Photographers of 70 King's Road, Brighton, and 114 New Bond Street, London. In 1865, Dickinson Brothers moved from No. 70 to No. 104 King's Road, Brighton. [ABOVE] A photographic portrait of James Watney junior (1832-1886), the eldest son of the brewer James Watney senior (1800-1884). A carte-de-visite produced by Dickinson Bros of 70 King's Road, Brighton, and 114 New Bond Street, London. The subject of the photograph was a partner in the beer brewing firm of Watney Combe & Reid. James Watney junior was elected MP for East Surrey in 1871. [ABOVE] Two versions of the Dickinson Brothers' trade plate as printed on the reverse of carte-de-visite portraits produced at their Brighton and London studios between 1862 and 1868. The Dickinson Brothers moved from No. 70 to No. 104 King's Road, Brighton, around 1865. 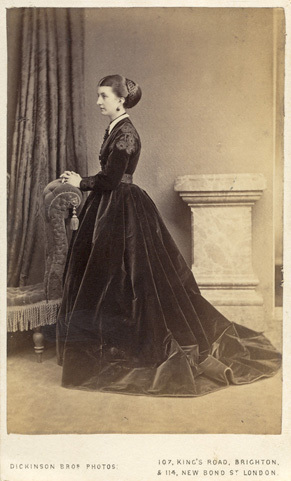 [ABOVE] A full-length portrait of a woman in profile, photographed at the Dickinson Brothers' studio (1867). 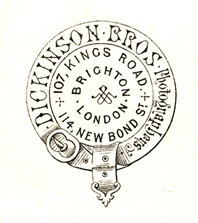 The photography firm of Dickinson Bros. operated studios at 107 King's Road, Brighton, and 114 New Bond Street, London between 1865 and 1867. Lowes Cato Dickinson was born in Kilburn, North London, on 27th November 1819, the fourth child and second eldest surviving son of Ann Rowden Carter and Joseph Dickinson, a stationer, print-seller and lithographic publisher. Lowes Cato Dickinson received his unusual first name courtesy of his paternal grandmother Mrs Jane Lowes Dickinson. Lowes Cato Dickinson showed artistic talent at an early age and when he was in his early twenties he was producing lithographic portraits for his father's print publishing business in Old Bond Street, London. (See examples below). 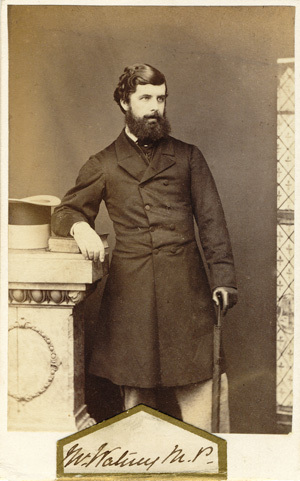 Between 1850 and 1853 Lowes Cato Dickinson studied art in Italy under the patronage of Sir Robert Michael Laffan (1821-1882), an Irish military officer and engineer. Returning to England in 1853, Lowes Cato Dickinson took a studio in Portland Place, London. 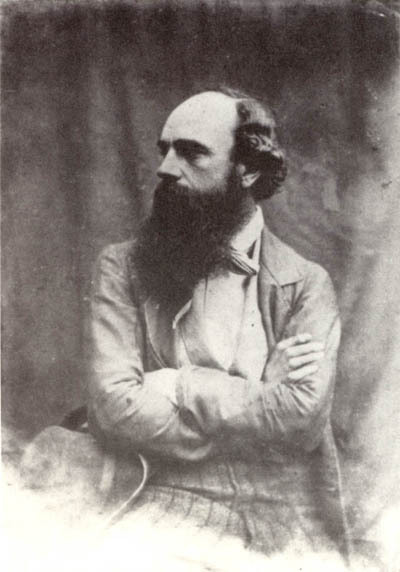 Whilst working as an artist in London, Lowes Cato Dickinson made the acquaintance of the artist Ford Madox Brown (1821-1893), the painter John Everett Millais (1829-1896), the artist and poet Dante Gabriel Rossetti (1828-1882), the writer and art critic William Michael Rosetti (1829-1919) and other members of the Pre-Raphaelite Brotherhood. On 15th October 1857, Lowes Cato Dickinson married Margaret Ellen Williams (born 1826, London). The couple went on to produce a number of children, at least five of whom reached adulthood - Arthur Lowes Dickinson (born 8th August 1859, Marylebone, London), Margaret May Dickinson (born 1861, Marylebone, London), Goldsworthy Lowes Dickinson (born 6th August 1862, Marylebone, London), Hester Fanny Dickinson (born 1865, Hanwell, Middlesex) and Janet E. L. Dickinson (born 1866, Marylebone, London). At the time of his marriage, Lowes Cato Dickinson was an established portrait painter. Lowes Dickinson went on to exhibit over a hundred oil paintings and crayon drawings at the Royal Academy between 1848 and 1891. When the 1861 census was taken, Lowes Dickinson was residing with his wife (Margaret) Ellen and their two young children at Langham Chambers, Portland Place, St Marylebone, London. On the census return, Lowes Dickinson is described as a forty-one year old "Artist & Painter". In 1864, Lowes Dickinson, together with his wife Margaret Ellen and their three children, Arthur, Margaret and Goldsworthy, moved to the west London district of Hanwell in Middlesex. Hanwell was located in a rural area, and according to a contemporary description was set in "beautiful and picturesque scenery", yet it had its own railway station and was situated less than 8 miles west of Paddington. Lowes Dickinson resided with his family at Spring Cottage, Hanwell. 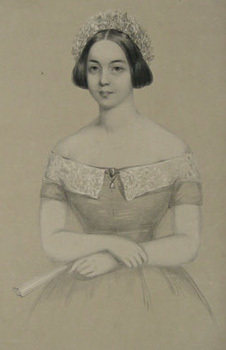 A daughter, Hester Fanny Dickinson, was born in Hanwell during the first quarter of 1865. When the census was taken six years later on 2nd April 1871, Lowes Dickinson and his wife Margaret were residing at Spring Cottage, Hanwell with their five surviving children - Arthur (aged 11), Margaret May (aged 10), Goldsworthy (aged 8), Hester (aged 6) and Janet Dickinson (aged 4). On the census return Lowes Cato Dickinson is recorded as a fifty-one year old "Artist & Portrait Painter". In 1879, Lowes Dickinson and his family moved into a newly-built house at No. 1, All Souls Place, Langham Place, Hanwell. When the census was carried out on 3rd April 1881, Lowes Cato Dickinson, described as a sixty-one year old "Artist-Painter" was up in Scotland, visiting the family of Archibald Campbell, a steel manufacturer of Barony, Lanark. At the time of the 1881 census, the artist's spouse, fifty-four year old Mrs 'Millie' Dickinson, described on the return as a "Portrait Painter's Wife", was recorded at 1, All Saints Place, Hanwell, with her three daughters. Both of Lowes Dickinson's sons were living away from home - Arthur Lowes Dickinson was an undergraduate studying Mathematics at King's College, Cambridge, and eighteen year old Goldsworthy Lowes Dickinson was boarding at Charterhouse School in Godalming, Surrey. 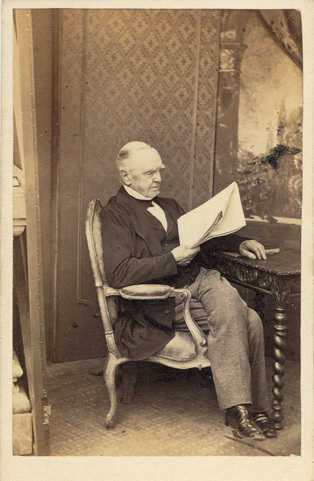 [ABOVE] A portrait of the artist and painter Lowes Cato Dickinson (1819-1908), a calotype photograph (Talbotype) taken around 1853 when the artist was in his early thirties. 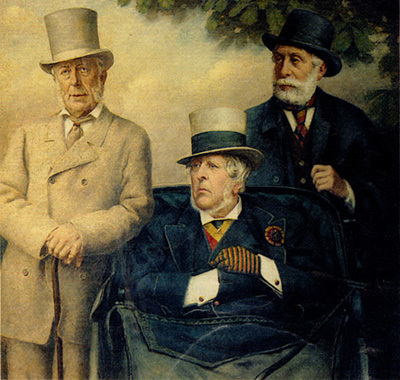 [ABOVE] The Three Founders of the I Zingari ("The Gypsies") Cricket Club by Lowes Cato Dickinson (1819-1908). Standing on the left of the picture is Sir Spencer Ponsonby-Fane (1824-1915). Seated in the middle of the trio is John Loraine Baldwin (1809-1896). The bearded figure on the right is probably Richard Penruddocke Long (1825-1875). This group portrait was probably based on studio photographs. [ABOVE] Lowes Cato Dickinson (1819-1908), photographed around 1903 by Frederick Hollyer (1838-1933). This photograph shows Lowes Dickinson when he was in his early eighties and was published in 1904. 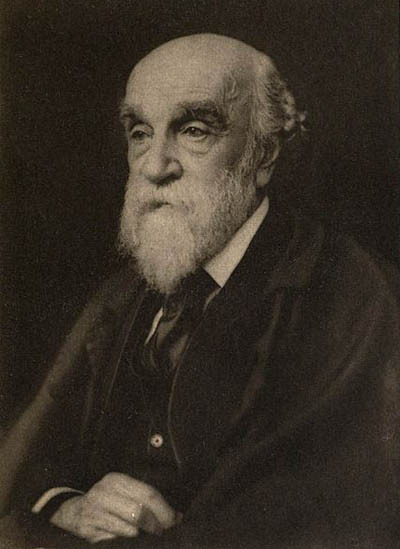 Lowes Dickinson died on 15th December 1908 at the age of 89. 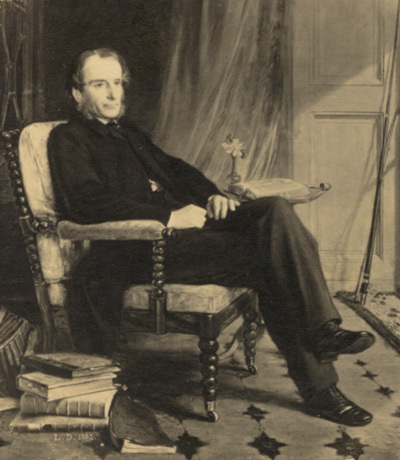 [ABOVE] Charles Kingsley (1819-1875), the Rector of Eversley and Professor of Modern History at the University of Cambridge, as depicted in an 1862 portrait by Lowes Cato Dickinson (1819-1908). Charles Kingsley is perhaps best known today as the author of the children's novel "The Water Babies"(1863). 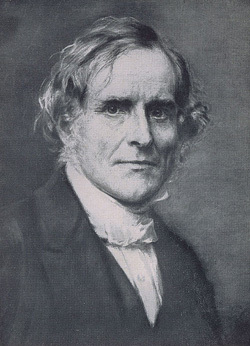 Charles Kingsley, like Lowes Cato Dickinson and Thomas Hughes, was a Christian Socialist. Rev. 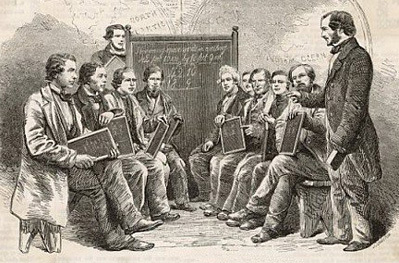 Kingsley gave support to the London Working Men's College, which was founded by Frederick Denison Maurice, Thomas Hughes, Lowes Cato Dickinson and other leading Christian Socialists in 1854. 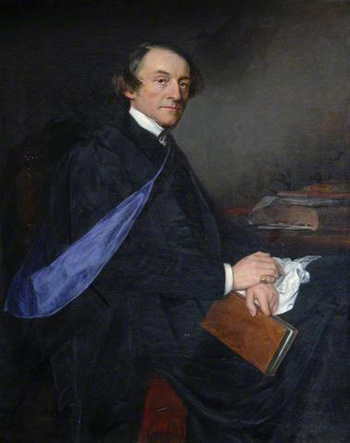 [ABOVE] The theologian Fredrick Denison Maurice (1805-1872), a founder member and first Principal of the London Working Men's College. Rev. F. D. Maurice, who was a Christian Socialist, was the Principal of the London Working Men's College between 1854 and 1872. Together with Miss Frances Martin (c1829-1922), F. D. Maurice helped establish the College for Working Women (for 'women only') in 1874. [ABOVE] A photographic portrait of Thomas Hughes (1822-1896), the lawyer and author who wrote the novel "Tom Brown's School Days" in 1857. Hughes was one of the founders of the London Working Men's College In 1854, Lowes Dickinson, together with the lawyer and author Thomas Hughes (1822-1896), the theologian Frederick Denison Maurice (1805-1872) and other members of the Christian Socialist movement, founded the London Working Men's College. [ABOVE] A nineteenth century drawing class. 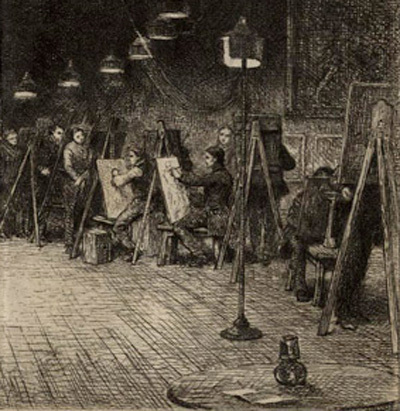 The portrait painter Lowes Cato Dickinson, along with John Ruskin, Ford Madox Brown, Edward Burne-Jones, Dante Gabriel Rossetti, Alexander Munro, Thomas Woolner and Valentine Cameron Prinsep taught Art at the London Working Men's College. 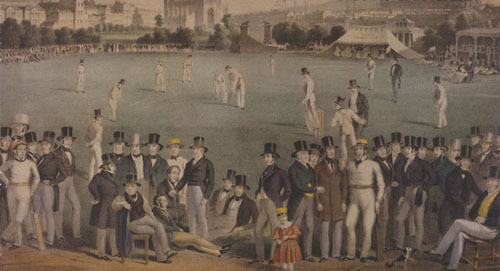 The idea of producing "Composite Group Portraits" at sporting events was pioneered by the Brighton print publisher W. H. Mason in 1849, when he published a picture entitled "The Cricket Match between Sussex and Kent at Brighton", featuring 60 individual portraits of the most famous cricketers of the day. In the 1880s there was a short-lived fashion for "Subscription Pictures". A local newspaper would announce in advance the intention of an artist to record a significant or fashionable sporting event, such as a horse race or cricket match. Individuals who wished to be featured in this pictorial record of the event would make a contribution to the cost of the painting. The bigger the financial contribution, the larger and more prominent the figure would appear in the finished painting. The big spenders would appear conspicuously in the foreground of the picture, while those of more modest means would be depicted in a sea of faces in the background. There is evidence that the artist Lowes Cato Dickinson produced a number of "Subscription Pictures" in the mid-1880s. 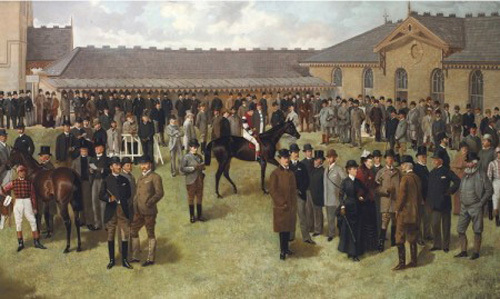 It appears that Lowes Dickinson was involved in the production of two large oil paintings on a "subscription" basis in 1885 - "The Birdcage at Newmarket", showing race-horse owners, trainers, jockeys and fashionable race-goers assembled in the winner's paddock on the day of the "2,000 Guineas" horse race (see below), and the "Yearling Sale at Doncaster", which depicts a large collection of figures assembled to witness and participate in the sale of young horses at the Tattersall Horse Ring in the Waterdale area of Doncaster (see above). The Doncaster Museum Service has discovered the original notice which appeared in the local press announcing that a picture would be painted commemorating the Yearling Sale at Doncaster and that the large oil painting would "contain the portraits of all the leading owners, breeders, and trainers as well as many of the frequenters of this busy scene, where may be found, year by year, a gathering of every one of note connected with horses". [ABOVE] "The Birdcage at Newmarket on the 2000 Guineas Day"(1885), a composite painting by Lowes Cato Dickinson. 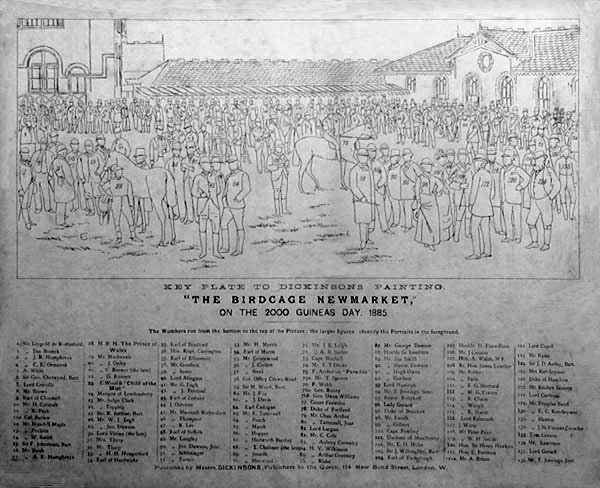 A lithographic print of "The Birdcage Newmarket" was published by Messrs. Dickinsons, Publishers to the Queen, 114 New Bond Street, London shortly after the painting was completed in 1885. [ABOVE] The Key Plate to Lowes Dickinson's painting "The Birdcage at Newmarket on the 2000 Guineas Day"(1885). The above Key was issued with lithographic reproductions of Dickinson's original picture published by Messrs. Dickinsons of 114 New Bond Street, London. The individuals identified in the numbered key include Edward, the Prince of Wales, Archibald Primrose, the Earl of Rosebery, and Fred Archer the winning jockey who came first in the 200 Guineas at Newmarket on his mount "Paradox" in 1885. Dickinsons of New Bond Street, London, was a family firm of artists, lithographic print makers and publishers, which was established in the early 1820s by the stationer and print-seller Joseph Dickinson (1780-1849). Joseph Dickinson was the father of thirteen children and at least four of his sons went on to become painters, lithographic artists and photographers. 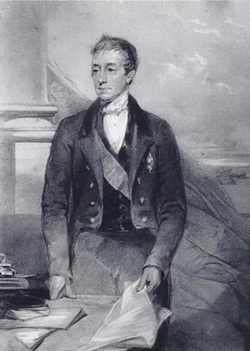 Around 1844, Joseph Dickinson's eldest surviving son William Robert Dickinson (1815-1887), generally known as W. Robert or Robert Dickinson, joined his father as a junior partner in the family business and from this date the firm was styled "Dickinson & Son". 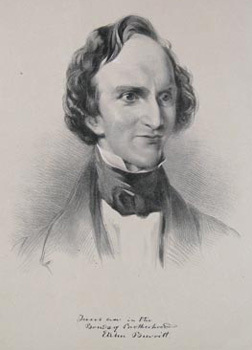 Another son, Lowes Cato Dickinson (1819-1908) became an artist and during the 1840s he either drew portraits or created lithographic prints from the work of other portrait painters, which were published as prints by his father's firm. 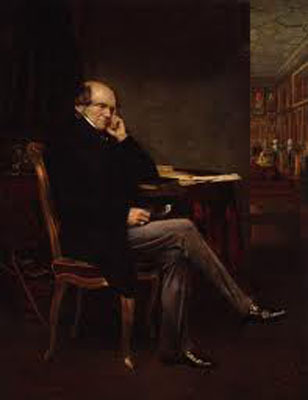 Lowes Cato Dickinson later became an established portrait artist, exhibiting 110 portraits in oils and crayons at the Royal Academy between 1848 and 1891. 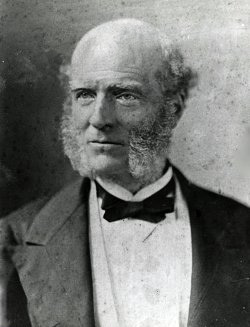 After the death of Joseph Dickinson in 1849, the family firm was inherited by his three eldest surviving sons - William Robert Dickinson (1815-1887), Lowes Cato Dickinson (1819-1908) and Gilbert Bell Dickinson (1825-1908). Under the name of Dickinson Brothers, the three brothers continued to produce lithographic prints and portraits at their business premises at 114 New Bond Street, London. 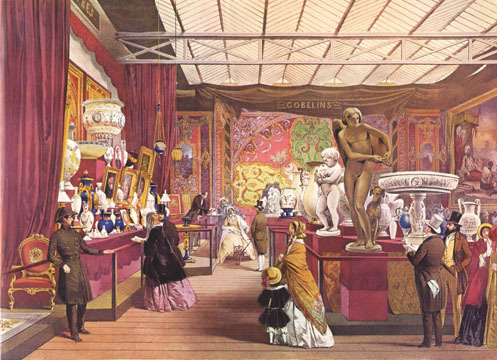 It was the firm of Dickinson Brothers which, in 1854, published a collection of fifty-five large coloured lithographs under the title of "Comprehensive Pictures of the Great Exhibition of 1851". The brightly coloured lithographic prints were taken from a series of paintings commissioned by Prince Albert of the various displays and galleries on show at the Crystal Palace during the Great Exhibition of 1851. [ABOVE] A detail of "The Birdcage at Newmarket on the 2000 Guineas Day"(1885), by Lowes Cato Dickinson. A total of 136 individuals are identified in the accompanying Plate Key (see above, right). The identified figures are listed in the numbered key which runs from No.1 to No. 136. For instance, the horse and rider that came first in the 2,000 Guineas Stakes is depicted in the centre of the original painting and on the Key Plate the line drawing is numbered 75. The Key Plate identifies the winning jockey (No.75) as Fred Archer mounted on the winning horse "Paradox". The detail above shows the central section of the painting, with Fred Archer, wearing the scarlet red body silks with black & white hooped sleeves, riding his mount "Paradox" towards the trainer John Porter and the horse's owner Mr. Broderick Cloete. 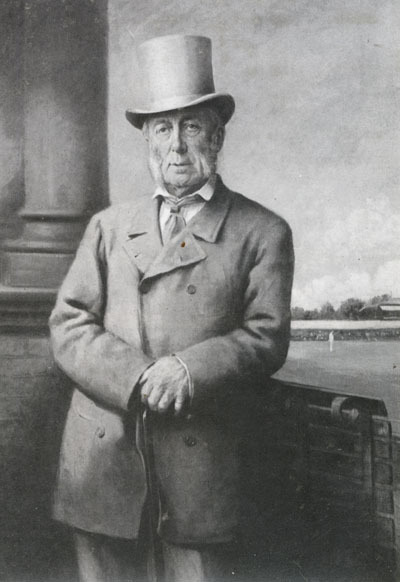 [ABOVE] A portrait of Sir Spencer Ponsonby-Fane (1824-1915),a founding member of the "I Zingari" Cricket Club, probably painted from a studio photograph by Lowes Cato Dickinson around 1885. This figure of Sir Spencer Ponsonby-Fane was used again in a group portrait to commemorate the three original founders of the "I Zingari" Cricket Club. [ABOVE] A carte-de-visite portrait produced at a Dickinson Brothers photographic studio during the 1860s. The firm of Dickinson Brothers produced oil paintings based on enlarged photographic portraits. 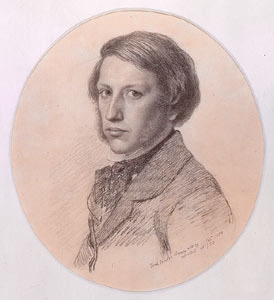 [ABOVE] The artist Ford Madox Brown (1821-1893) in a self-portrait drawn in 1850. Madox Brown was employed to colour the portraits at the Dickinson Brothers studio in New Bond Street. The portraits produced at the Dickinson Bros' studio in the 1850s were often worked up from photographs. 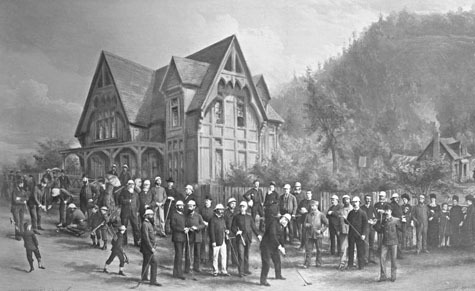 [ABOVE] A composite picture of The Royal Montreal Golf Club, produced in 1882 by the Scottish-born Canadian photographer William Notman (1826-1891) and the Canadian artist and illustrator Henry Sandham (1842-1910). Between 1877 and 1882, the firm of Notman & Sandham produced dozens of group portraits in the "composite picture" format. William Notman was born in Paisley, Scotland, in 1826, but emigrated to Canada when he was a young man. In 1856, William Notman established a photographic studio in Montreal. In 1860, William Notman expanded his studio and employed a team of artists at his premises in Bleury Street. Henry Sandham, a young artist and illustrator from Montreal, became the Head of Notman's Art Department in 1868. From around 1870, Henry Sandham helped William Notman to produce a series of large composite pictures featuring scores of individual portraits. In 1877, Henry Sandham joined William Notman to form the firm of Notman & Sandham. To read an account of the photographic career of William Notman and the production of composite photographs, and to view a number of examples of his large composite pictures, click on the link below which will take you to the website of the McCord Museum in Montreal. The McCord Museum website features dozens of pictures created by William Notman and his artists which employ the 'composite photograph' technique. When the patent restrictions on the new art of photography were removed around 1854, the Dickinson Brothers firm of artists and publishers diversified their activities to include photographic portraiture. 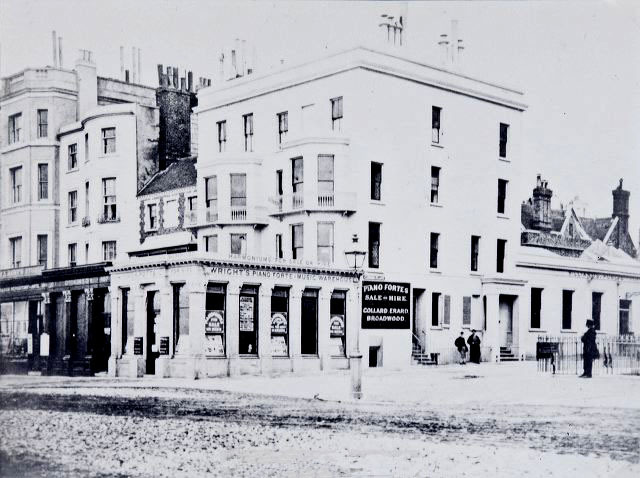 A photographic studio was established at 114 New Bond Street, London in 1855 and branch studios were opened in the seaside towns of Brighton (see top panel) and Scarborough in the 1860s. Between 1855 and 1856, at the Dickinson Brothers' studio in New Bond Street, Ford Madox Brown worked on at least four large portraits taken from photographs, including General Henry Percival de Bathe (1823-1907), a hero of the Crimean War, and Lord John Russell (1792-1878), the British Prime Minister. The practice of producing large painted portraits from studio photographs was continued by the firm of Dickinson Brothers over the next twenty years. The partnership between William Robert Dickinson Lowes Cato Dickinson and Gilbert Bell Dickinson had been dissolved in 1867, but William Robert Dickinson continued to head the publishing firm of Dickinsons until he was joined in the business around 1875 by Joshua James Foster (1847-1923), formerly with Agnew's Fine Art Publishers. The firm of Dickinson Brothers & Foster Ltd was in business for about a year. Joshua James Foster purchased the firm in 1876, but continued to trade under the name of Messrs Dickinson & Foster. In the 1880s, Joshua James Foster commissioned Lowes Cato Dickinson, an established portrait painter and former partner in Dickinson Brothers, to paint a series of "subscription pictures" on sporting themes [e.g. 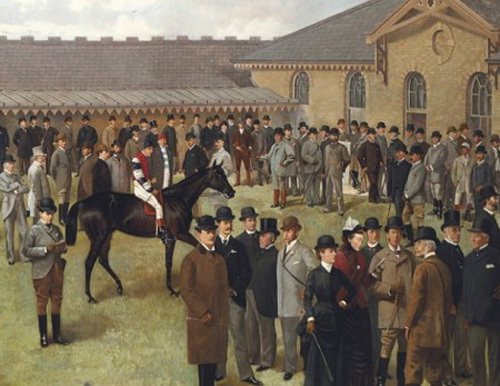 "The Birdcage at Newmarket on the 2000 Guineas Day"(1885), "Yearling Sale at Doncaster, South Yorkshire"(1885) ]. These large paintings containing up to 150 individual portraits taken from studio photographs were later issued as lithographic prints by Messrs. Dickinsons, Publishers to the Queen, 114 New Bond Street, London. ( It appears that Joshua Foster retained the name of Dickinsons long after the Dickinson brothers had left the firm in 1875, probably because of the Dickinsons' established reputation and long association with fine art publishing over a period of 50 years ). 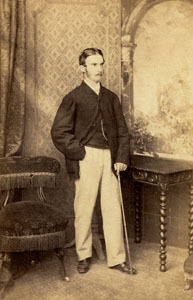 The composite pictures produced by Lowes Dickinson and published by Messrs. Dickinsons of 114 New Bond Street, London appear to have been heavily influenced by the work of the Scottish-born Canadian photographer William Notman (1826-1891). After studying the technique of composite photography pioneered by Oscar Gustave Rejlander (1813-1875), George Washington Wilson (1823-1893) and Henry Peach Robinson (1830-1901), William Notman produced his first major composite group portrait, in 1870. (The Skating Carnival at the Victoria Skating Rink in 1870, which featured 150 individual portraits). The method and techniques employed by William Notman and his Art Department in Montreal, Canada, were copied by Lowes Cato Dickinson and the London firm of Dickinson & Foster. An advertisement was placed in the local press announcing the intention to produce a large scale group portrait depicting a forthcoming event and inviting those who intended to attend the event to sit for a photographic portrait. After the individual photographic portraits had been taken, the figures in the photographic prints were cut out with fine scissors and pasted onto a previously prepared background (e.g. a lifelike painting of a horse-racing course, a cricket ground, etc) to form a composite picture. A team of artists would then blend in the figures with the painted background by adding shadows, blades of grass, etc. The finished pasted-up composition was then re-photographed on glass negatives of various sizes. Larger coloured versions of the composition could be created by using a solar enlarger to project the image on to a specially prepared canvas and then employing a professionally trained artist to use oil colours to paint over the monochrome photographic base. 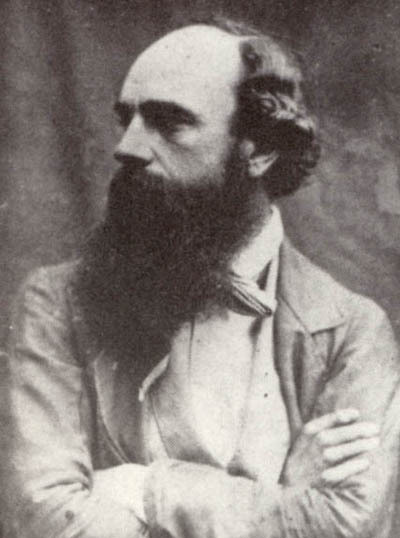 The portrait artist Lowes Cato Dickinson is known to have produced several large group portrait paintings on sporting themes which were based on composite photographs in the mid-1880s. (See the two examples above). Prints of these composite pictures were then published by "Dickinsons" (Joshua James Foster) of 114 New Bond Street, London. It appears that Lowes Cato Dickinson ended his association with Joshua James Foster and the print publishing firm of "Dickinsons" sometime before1891. 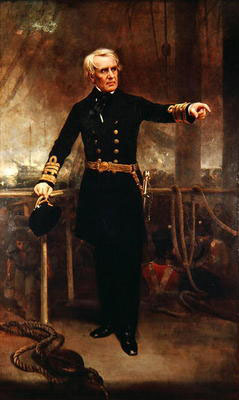 [ABOVE] A portrait of Admiral Edmund Lyons (1790-1858), a famous British naval commander in the Crimean War, painted by Lowes Cato Dickinson in 1855. Lowes Cato Dickinson would generally paint the heads in portraits and other artists would be paid to paint in the costumes and backgrounds. [ABOVE] A portrait of Lord John Russell (1792-1878), British Prime Minister, painted by Lowes Cato Dickinson around 1855. 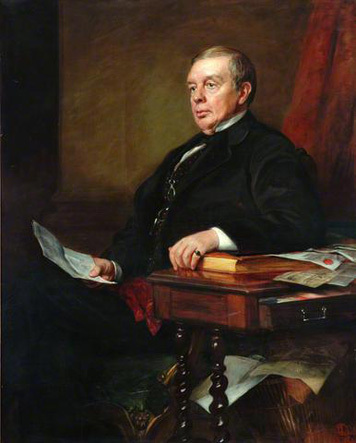 The artist Ford Madox Brown was employed by Dickinson Brothers to paint the clothes and the background of a Lowes Dickinson portrait of Lord Russell in 1855. This portrait was likely to have been based on a photographic portrait. [ABOVE] France: French Art and Design on display at the Great Exhibition of 1851, a coloured lithographic print published by Dickinson Brothers of 114 New Bond Street, London, one of fifty-five plates published in two volumes in 1854 under the title of "Comprehensive Pictures of the Great Exhibition of 1851". 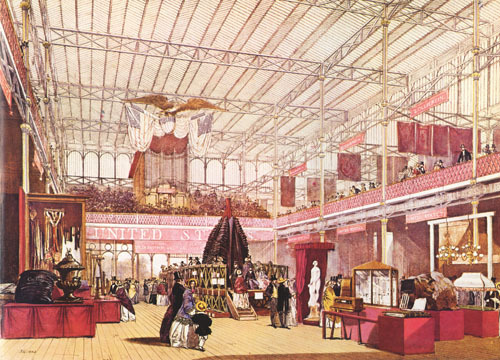 [ABOVE] United States of America: American Art and Design on display at the Great Exhibition of 1851, a coloured lithographic print published by Dickinson Brothers of 114 New Bond Street, London, one of fifty-five plates published in two volumes in 1854 under the title of "Comprehensive Pictures of the Great Exhibition of 1851".